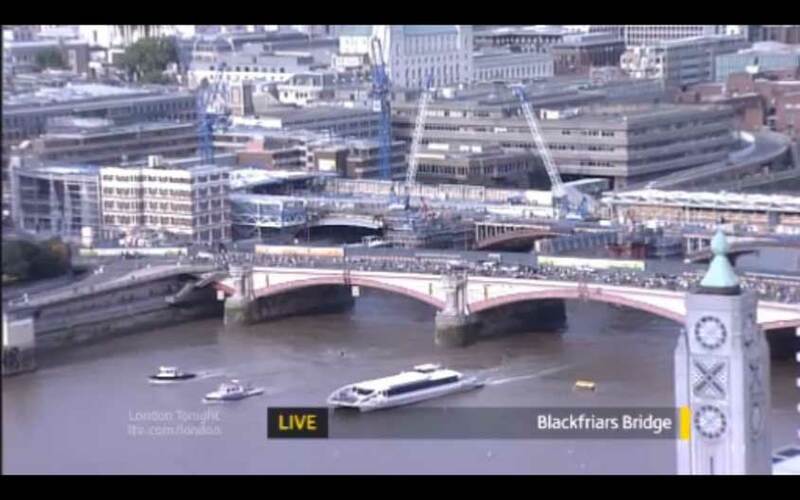 I mentioned in a previous post, in passing, the lengthy interview that the Mayor of London's "Champion for Promoting Cycling", Andrew Boff, Conservative London Assembly Member, gave to The Bike Show on Resonance Radio, on the vexed issue of the redesign of Blackfriars Bridge. The benefits [of prioritising the bike in a city] are clear on many levels, not least in terms of economy. Danish research has found that for every KM cycled, society saves 30 cents. For every KM driven, society looses 20 cents. Biking is not just about having fun and being ‘green’; it pays, too. No wonder Copenhagen is doing so well economically. It has a 37% modal share by bike, compared to London's 1.5%. What Boff says in his interview strikes me as very contradictory in a number of ways. He freely admits that he feels Blackfriars Bridge is dangerous to cycle on, and he wouldn't use it. It is not on his commute, but, if it was, he says he would go another way round. (Boris does commute across Blackfriars Bridge.) But then he doesn't seem to be certain that Transport for London are actually taking the wrong decisions on Blackfriars. He spends quite a lot of time proposing that the main issue is the secrecy with which TfL arrives at its decisions, and how it hides its evidence and decision-making process from the public, and from the Assembly Members. He says he thinks there is a possibility that TfL is taking exactly the right decisions, for good reasons, but the problem is secerecy and TfL not explaining itself properly. Now, this may just be a way in which Boff is trying to be diplomatic and avoiding attacking the managers of TfL too explicitly. But it sounds very odd to me. For though having a process of secret and unaccountable decision making is very bad, what is far worse is the bad decisions themselves, when those decisions have killed people, specifically, the two cyclists killed on the bridge in 2006, and seriously injured others. After those deaths, a report by TfL itself recommended that the speeds on all the London crossings shared with cyclists should be reduced to 20 mph as a cycle safety measure. Boris Johnson has stated he disagrees with this advice and is ignoring it (or, rather, in the latest version, he has been advised by persons unknown that it is bad advice, and he is ignoring it). What Boff is saying sounds very like what all politicians say just before they massively loose elections: "Our policies are right, we just haven't done enough to explain them". In other words, the problem is not what we're doing, its just the way we are presenting it, and the public doesn't understand our reasons. Politicians in power often adopt this arrogant attitude, and it always leads to the public giving them a bloody nose shortly after. It doesn't seem to occur to Boff here that if he feels Blackfriars Bridge is dangerous to cycle across, then that proves conclusively that TfL have failed cyclists here, irrespective of any shortcomings of their explanations to the public or politicians. It seems that, though a commuting cyclist himself, Boff doesn't actually believe that main roads in our cities should necessarily be cycleable, if that conflicts with the requirement, in his world-view, of allowing sufficient motorised traffic to "keep the economy healthy". He also states that there are many people who will never cycle, however safe you make the roads for them. This is undoubtedly true, and the same argument was put to Mark of ibikelondon by Eric Pickles in his famous "rubber knickers" interview. But this argument is always over-sold in this country, and it is always pushed by those who are resisting making cycling safer and more attractive. If 37% of journeys in Copenhagen are made by bike, that shows that most people in Copenhagen are prepared to cycle for at least a few of their journeys, and many others use cycling as their main mode of transport, or for a good proportion of their journeys. If you make cycling attractive enough, most people will use it some of the time. Those who will never use it, or can never use it, under any circumstances, are a small minority. But London, at its modal share of 1.5%, is currently at the opposite pole, and the argument that "some people will never cycle whatever you do" is actually totally irrelevant to policy, and an excuse for not addressing the issues. The issue in London is allowing the majority who want to be able to cycle the opportunity to do so in safety and comfort. Nobody is talking about preventing those who need to use motor vehicles from doing so. Nobody ever says that you shouldn't invest in railways because "some people never take the train", or not invest in roads for cars because "some people will never drive". This line is transparently foolish. Where I agree with Boff 100% is in the final section of the interview, where he strongly criticises the current political system in London (set up by the Blair government), with an executive Mayor who has an almost impossible job in being expected to manage so many separate and different technical areas (transport, policing, culture, planning), who is forced therefore to rely too heavily on unelected, unaccountable apparatchiks that he alone appoints, and who is effectively democratically unaccountable himself after he has been elected for 4 years, with a largely pointless and toothless elected Assembly that has one opportunity a year to reject or accept a budget, and then spends the rest of its time lamely scutinising decisions after the fact. This is a bad system, and it tends to bad decision-making and corruption. London deserves better. But I come back to this point about the economics of providing for cycling as against providing for cars, as the logic is so bizarre. Why should giving over a large part of Blackfriars Bridge to cyclists (and pedestrians) impact the economy of London adversely? This is implying that somehow we just happen to have a distribution of priorities on London's bridges at the moment that is economically optimal for the city. Is this likely? Perhaps not, perhaps the economy would do even better if we gave cars more space. If this is the case, is it not wrong that we have a whole bridge across the Thames (the Milennium Bridge) devoted to walkers? Surely TfL is being irresponsible with the economy of London if it does not immediately evict pedestrians from the Millennium Bridge and hand it over to cars (those little electric cars that the government is doing so much to push as the "future of transport" might not be too heavy for it, and, if they are, then why not strengthen it?). Where does this "logic" end? In Boff's long interview, I keep wanting to ask, "Well, OK, but what is your solution?" He doesn't seem to have one. As a just a politician, just someone who happened to get elected, he tells us, he can't be expected to be an expert on anything in particular, that's why we need the "experts" at TfL to explain their decisions better. The reasonable man, of course, believes in the authority of experts – a concatenation of famous sayings by famous people that I just invented. But no-one in this programme approached in any way proposing a solution to the "Blackfriars Problem". People seem to be too afraid of having an opinion that could be contested by "experts". London Cycling Campaign has just voted that its future policy should be "Going Dutch". If that is the case, why didn't LCC's Charlie Lloyd, interviewed before Boff, launch this new policy in this programme by proposing a Dutch solution to Blackfriars? We know what the Dutch solution would be, as David Hembrow has helpfully told us, providing numerous examples to prove his point. And it's not rocket science, it's not something you need a great expert on transport to explain to you. The Dutch would give cyclists their own ample, dedicated, safe and separated space on the bridge, and signalise the junctions at the ends so that cyclists could go in the directions they needed to go with a minimum of delay and with no interaction or negotiation with motor vehicles or pedestrians at all. Golly, how come they can think of that when all the great experts at TfL can't? Perhaps it's living below sea-level that concentrates the mind. Now, what's the purpose of that big shiny metal thing that spans the Thames near Woolwich? Perhaps there's hope for London yet.